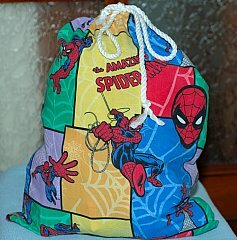 Drawstring bag for hand sewing lessons. Cut out 2  5 inch squares of fabric. Put right sides together. Right sides are the sides with the design on them. These sides will be showing when you finish the project. Sew along sides of fabric leaving the top open. Use a straight running stitch with your stitches close together. Once you have finished the sides. 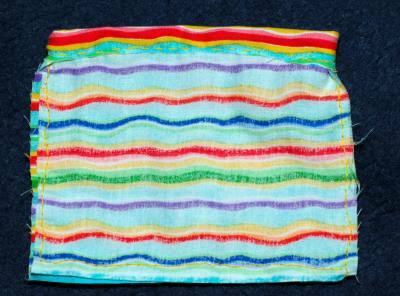 Turn the top down ¼ -1/2 inch and sew a straight stitch along the bottom. Be srue you only sew through one side. Turn material right side out. Thread yarn with a large needle but don't tie the end. With the yarn, stitch a straight stitch along the top edges leaving excess at the beginning and at the end. Tie ends together. Stitch another row of yarn under the first row making sure you leave excess yarn at the beginning and end. Tie ends when you reach the end. 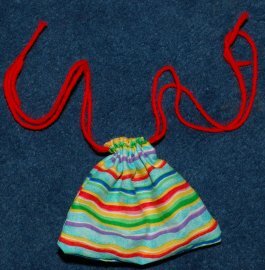 You can pull the yarn to close the bag. 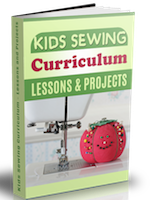 **Later on this project can be done easily on the sewing machine. We practiced hand stitching in Level 1. 2. Lay out the hand towel on a flat surface. 3. Then fold the laid out hand towel in half. 4. 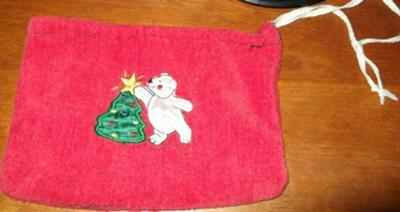 Now get your felt picture and place wherever you think it looks best pin to one side of hand towel. 5. Once you have pinned it down get your needle and cotton and sew around the edges in blanket stitch. 6. Once the hand towel is folded sew all the way through both sides. 7. Now repeat on the other side. 8. Then fold over the top of hand towel about 3cm. 9. Then sew all the way around leaving a space of 2cm so you can thread your draw string through. 10. When you have finished doing that get your draw string and a safety pin. 11. Put your safety pin through one end of the draw string. 12. Then thread the draw string through the opening of the hem. 13. Leaving both ends of the draw strings out of either end so you can see them. 14. 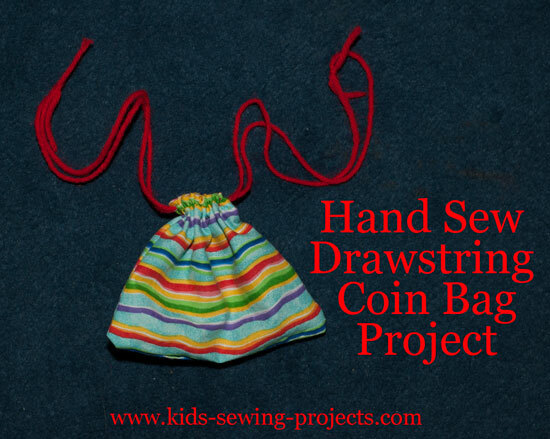 Remove safety pin from draw string. 15. Then get both ends of the draw strings and tie them in a knot. 16. Then pull them tight until you have closed off the top of your bag. 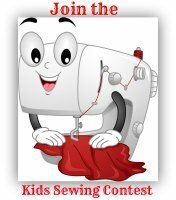 Would you like more advanced instructions from Level 3 on sewing a drawstring bag on the sewing machine?